Barcelona’s lead at the top of the Spanish La Liga was cut to just a single point following last weekend’s action. 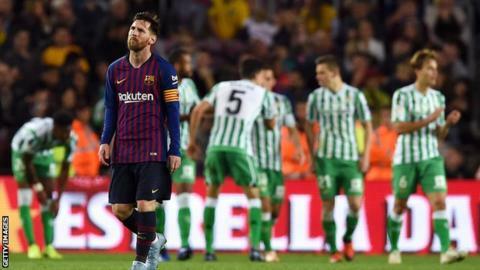 Ernesto Velvarde’s side who were welcoming back Captain Lionel Messi from injury could not be inspired as they went down 3-4 at home to Real Betis. Junior Firpo and Joaquin put the visitors 2-0 up at half time before Messi reduced the deficit from the spot on 68 minutes. Giovanni Lo Celso restored Betis’ two goal caution three minutes later before Arturo Vidal again reduced the deficit again. With seven minutes to play, Sergio Canales made it 4-2 to the visitors and despite Messi scoring in the 90th minute, Barcelona who lost Ivan Rakitic to a red card on 81 minutes succumbed to a first ever league defeat at home in over two year. The last time Velvarde’s side had lost at home was on 10th September 2016 when Deportivo Alaves defeated them 2-1. Barce’s loss was pounced onto by the trio of Atletico Madrid, Alaves and Sevilla who all came from behind to overcome Athletic Bilbao, Husca and Espanyol in their respective fixtures. Their victories mean that they all now sit joint second with only a point separating them from the defending champions. Elsewhere, record league champions-Real Madrid powered past Celta Vigo 4-2 in the last game of match day 12. A goal from Karim Benzema and another by Celta’s Gustavo Cabral (OG) put Real 2-0 up by the 56th minute. The home side pulled one back thanks to Hugo Mallo just past the hour mark but Sergio Ramos and Dani Ceballos made it 4-1. In additional time, Brias Mendez cut the deficit to two for the home side but that is as close as they came, ensuring that Santiago Solari registers his second league victory since taking charge. On Saturday, Valencia required a Dani Parejo penalty nine minutes from time to overcome 10 men Getafe who had seen Bruno Gonzalez sent off on in the 79th minute. In Ligue One, PSG continued their perfect start to the 2018/19 season thanks to a 4-0 victory over Theirry Henry’s Monaco. 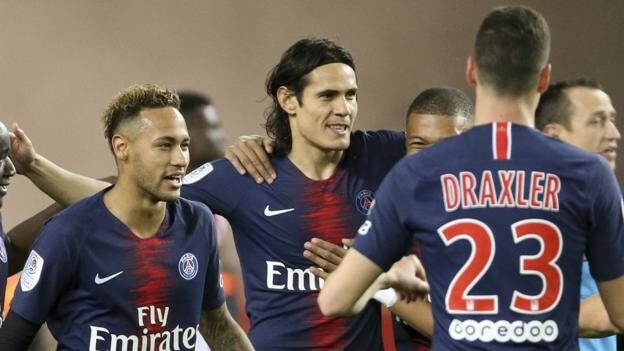 A hat-trick from Edison Cavani and a Neymar Jr penalty were enough to hand PSG their 13th consecutive victory since the start of the campaign. The victory means that PSG now hold a 13 point caution on second placed Lille who drew 0-0 at home to Strasbourg. Earlier in the day, Adel Rami and Lucas Ocampos were both on target as Marseille defeated Dijon 2-0 to move into 6th on the log. Elsewhere, Memphis Depay scored a brace, Hossem Aouar and Gnaly Cornet added one each as Olympic Lyon defeated bottom side-Guingamp 4-2 at the Stade du Roudourou on Saturday evening. Marcus Thuram scored Guingamp’s two goals on the day. There were also wins for Patrick Viera’s Nice who defeated nine men Nimes 1-0, St. Etiene put two past Reims while Angers narrowly took care of third placed Montepellier 1-0. In the Italian Serie A, Juventus continued their march towards a 7th consecutive title, defeating AC Milan 2-0 at the San Siro. Goals by Mario Mandzucik and Cristiano Ronaldo ensured the Old Lay maintains a six point advantage over Napoli in second. Carlo Ancheloti’s side had a day earlier made to work for their 2-1 victory at Genoa. Ivorian Christian Kuoame put the hosts 1-0 up inside 20 minutes but two second half goals from Fabian Luiz and an own goal by Davide Birashe gave Napoli all three points. Earlier on Sunday, Atalanta humiliated Inter Milan 4-1 in Bargamo. Hans Hateboer, Gianluca Mancicni, Berat Djimsiti and Alejandro Gomez were all on target for Piero Gasperini’s side while Mauro Icardi scored Inter’s only goal. For Roma, they were 4-1 victors over Sampdoria at the Stadio Olimpico. Juan Jesus put the hosts ahead on 19 minutes before second half goals from Patrick Schuck and Stephen El-Sharrawy (x2) sealed the points for the Capital club despite Gregoire Defrel temporary making it 3-1 in the 89th minute. In the other high profile game, Lazio were held to a 1-1 draw away to Sassoulo. Marco Parolo put Lazio ahead on 7 minutes before Gianimarco Ferrari equalized for Sassoulo eight minutes later. The draw moves Lazio back into fourth on the table, only a point ahead of Milan in 5th. In Germany, Borrusia Dortmund continued their unbeaten start to the league thanks to a 3-2 comeback victory over rivals Bayern Munich on Saturday at the Signal Iduna Park. Robert Lewandowski put the visitors in the lead with 26 minutes played. Marco Reus drew Dortmund level with a penalty four minutes later but Lewandowski struck again to put Bayern back in front. However, Rues equalized again before Parco Alcercer won it for Lucian Favre’s side with 17 minutes to play. The victory means Dortmund maintain their three point caution atop the standings after second placed Borrusia Monchengladbach also won 3-1 away to Werder Bremen earlier. Alesan Plea was the hero for Deiter Hecking’s side, scoring a hat trick that sees him move to 8 goals. In the two games played on Sunday, RB Leipzig defeated Beyer Leverkusen 3-0 at the Red Bull Arena to move into third. Yussuf Poulson scored a brace and another goal came from Lukas Klostermann. Frankfurt also defeated Schalke by the same scoreline. Luka Jovic took his tally for the season to 9 with a brace while Sebastian Haller scored the other for Adi Hutter’s side who now move into 4th, level on points with Bayern in 5th. At the wrong side of the table, all three bottom sides-Hannover, Dusseldorf and Stuttgart registered rare victories over Wolfsburg, Hertha Berlin and Nuremberg respectively.